In the Rudd Government's attempt to 'sell' the Fair Work Bill currently before the parliament, ministers have relied on an appeal to a middle ground. Employers haven't got everything they wanted, we are told, and neither have the unions. So the Bill must be about right ... right? Were we to judge a piece of legislation as if it were a pendulum, which is what several Rudd ministers seem to want us to do, we would first point out that the Howard legislation was extremely unbalanced; prohibiting employers and employees from including specified matters in enterprise agreements, fining individuals or unions for asking for prohibited content, making industrial action by employees almost impossible to carry out (while allowing employers to engage in industrial action with relative ease), ceasing the conditions of an enterprise agreement once it had nominally expired. Using WorkChoices as any point of comparison defies commonsense understanding of the pendulum metaphor. The jig of 'striking a balance' was up three years ago when Barnaby Joyce said he could support the passage of WorkChoices because he had been assured that public holidays would be retained! A much less vacuous way to argue is to debate proposals on their intrinsic, intellectual merit, rather than whether they strike a balance between, say, Margaret Thatcher and Genghis Khan. What was particularly concerning during 2007 was that the parliamentary Labor Party, secure on a wave of vociferous community opposition to the Howard Government's industrial relations laws, consciously pulled down the public's expectations by focusing disproportionately on AWAs and the most visibly extreme of the laws. It is a measure of the extremism of where we have been — and, sadly, where we largely remain — that Greg Combet last Wednesday boasted that the new legislation would ensure that each employee could choose to be a member of a union. It is precisely because the Labor Party, aided and abetted by the mainstream media, zeroed in on the absurd and outrageous features of Howard's legislation that the more submerged and dangerous aspects of the laws went largely unremarked. As we debate the new Bill, the challenge is to flush out its neoliberal presuppositions. One of these precepts is that, in exercising their right to take industrial action, workers should be obliged to undergo a secret ballot. It seems difficult to be opposed in principle to a secret ballot, given the historical association with democratic movements. The worrying facet is that a secret ballot suggests employee-employee coercion is a potential problem while employer-employee coercion in the lead-up to strike action is not. Even more concerning is the practical effect of secret ballots. A secret ballot delays and entangles. One conservative calculation of the period needed to take industrial action, so that such action would legally comply with WorkChoices, was more than two months. Other neoliberal tenets abound within the new Bill. No strike pay is allowed. The Bill persists with the pretense of honouring the principle of workers having the right to take industrial action, while subjecting it to a test that will take account of the economic interests of third parties (which means the principle is not honoured at all). It is difficult to conceive of any strike action that would not affect third parties or sections of the economy. No wonder Heather Ridout is happy with the Bill. Perhaps most insidious of all is the practice of paying homage to collective bargaining while keeping Howard's ban on pattern bargaining. The position is doubly contradictory because it also flies in the face of the principle of equal pay for work of equal value (elsewhere enunciated in the Bill). The attempt to justify the neoliberal antipathy to collective bargaining across an industry is based on a false choice: efficiency versus equity. In more specific terms, (less rabid) neoliberals would have us believe that we have to balance — there's that word again — fair outcomes against productivity. And productivity growth, we are told, is threatened by pattern or industry bargaining. Well, no it isn't, but that's an argument for another day. We ought to be wary of any ideology that makes us compromise with falsity. The architects of the Fair Work Bill 2008 would have served the community immeasurably better by jettisoning neoliberal ideas, identifying first principles of justice, and allowing everything else to flow from there. There is no trade-off between prosperity and justice. We can have both, and should demand nothing less. Tim Battin is senior lecturer in politics at the University of New England, and is author of Choice for Whom?, a critique of the Howard IR legislation from the viewpoint of Catholic social thought. Recent articles by Tim Battin. It is extraordinary that the neo-lib economic policy that gave rise to WorkChoices robustly survives the demise of the Bush administration and the onset of a global financial crisis partly caused by its values. The theories, and the lobby group for them,remain alive and well enough to undermine the integrity of the Fair Work restitution of balance to the IR system. There are welcome features of the Labor changes, most notably the eventual restoration from 1 January 2010 of a close to adequate safety net for workers below the $100,000 threshold. Otherwise, Fair Work is attended by a process-rich stifling of the collective bargaining system, the absence of any barrier to preclude future statutory interventions to destroy independent functioning of the new independent umpire, and a'neutrality' that characterizes so much of the model, especially in regard to union roles in representing interests of employees and in maintaing access to flexibility terms that will operate to aid the reduction of union presence in workplaces. These are all are very troubling features of the legislative package. This is curate's egg legislation by a government intent on remaining electable through not provoking the agents of corporate global capitalism in Australia. No one who worked to overthrow WorkChoices should cease to pay close attention to the adequacy and durability of the Fair Work system that retains so many of the WorkChoices settings. Ironically, a truer restoration of balance may be led by the incoming US adminstration: during the campaign, Barack Obama, pointed to teh need for a President who didn't "choke whenever he has to say the word union"; of course it remains to be seen how that need will be translated by the new administration. We do know that our own leader will not choke when the subjects of unionism or workers rights to strike come up; he will have already left the room because he won't want to be caught in a wrong photo opportunity! A somewhat unbalanced article Tim. What you're missing is the increasingly enlightened attitudes shown by today's successful employers when they don't have to deal with unions running a class struggle agenda. Most employers, along with most of the workforce, have moved on, unlike many unions, particularly those in the public sector. Put simply, it makes good business sense to treat employees fairly. Unfortunately many unions see such attempts as undermining their power base or as a sign of weakness. Workchoices, for all its flaws, was at least an attempt to address these facts. 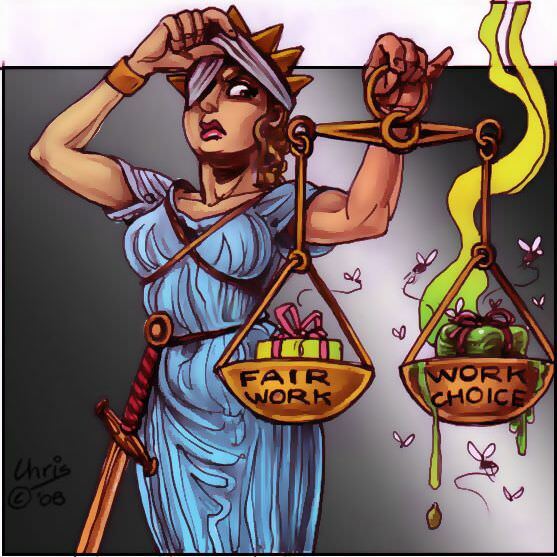 The other side of unfair dismissal laws (at least for small business) is that they are rorted by the unscrupulous, creating a strong disincentive to employ people. Tim seems to be a nice young man, an idealist. 'We ought to be wary of any ideology that makes us compromise with falsity' he writes. That's a bit like saying that we should be wary of any theology that makes us compromise with sin. Balance needs to be controlled by regulation. Does balance still allow legal payment by a business to a Union in order to achieve industrial peace? Does balance still allow strikes in the middle of concrete pours? Does balance allow the pseudo training safety ripoffs of the mining unions? etc It's war out there. Well said. Labor has sold out those that voted them in. 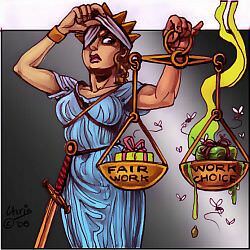 Employers are feted and workers treated as criminals. Forget the bigots calling you unbiased, I work both sides and know you are objective and right. Worthy sentiments. What a pity Jesuit Social Services is happy to apply WorkChoices legislation when it suits them. The protesters who occupied Bangkok's airports are claiming victory in their political battle, following the Constitutional Court's dissolution of the ruling party. But this is far from the end. The government is down, but not out. A fashion magazine proposed that 'blowing the budget on something outrageously extravagant will let you know you're still alive'. There is a place for fantasy during financial hard times, but there are also good reasons to act decisively.